CARE MANAGERS, GET YOUR COMPLIMENTARY EBOOK! A tool to help you introduce creativity and innovation into your team! How do you as a case manager find new ways to solve problems in an increasingly complex work environment, with increasingly complex plan members to care for? 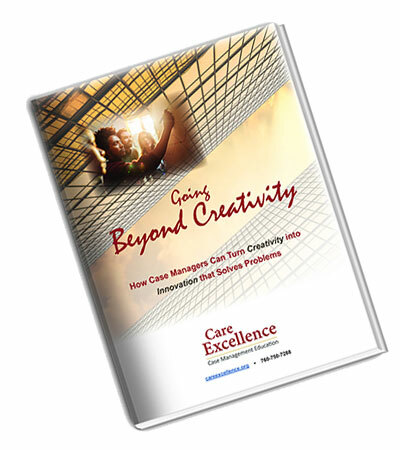 Our FREE eBook, GOING BEYOND CREATIVITY – How Case Managers Can Turn Creativity into Innovation that Solves Problems gives you some helpful answers to these questions, and more! In a quick, easy to read format, you’ll gain ideas and be given a few easy activities to help you try out what you’re learning! Additional resources to help you explore the topic of creativity are included too! Fill in our sign-up form to request your copy of our eBook TODAY! How does innovation differ or overlap with creativity? How to unlock your creative intelligence and that of others. What is holding back creativity and can that be changed? Is there a process to follow to help transform my team into a creative, innovative team? What can I do within the constraints of my environment? Creativity and innovation is one thing, putting it to work is another. How do I operationalize innovation? How can I sustain innovative thinking in my team? Care Excellence is your source for comprehensive education for those in care management roles in health plan organizations. Check out our comprehensive lineup of self-paced Care Management courses! These courses, developed by experts and based on real-world curriculum, provide a detailed exploration of the core principles and practices of care management. Geared toward new or aspiring care managers, our foundational courses lay out the essential skills necessary to work as a case manager, including motivational interviewing, relationship building and care planning. Learn more. Our Advanced Concepts courses are for experienced case managers who are working with patients with special and complex care needs, and whose responsibilities include decreasing cost of care and improving quality of care. Learn more. Out Leadership Education courses teach supervisors, managers and other healthcare leaders a range of effective strategies for mentoring and supporting care managers in ways that benefit patients and providers. Learn more. See our entire Care Excellence Course Catalog Here!